Strafford resident Tii McLane was a Peace Corps volunteer in Benin, West Africa, and after returning in 1997 she continued to keep in touch with the village where she served, returning twice. More than anything else, the villagers of Adjan-houeta wanted a cistern for their six-room elementary school. A more reliable water supply was needed both for sanitation and for school gardening projects. When Tii explained the need, the Strafford UU Church voted to undertake the project. In one summer, over $5,000 was raised. Tii and Church member Katie Botsford traveled to Benin to oversee the work, much of which was done by the villagers themselves. 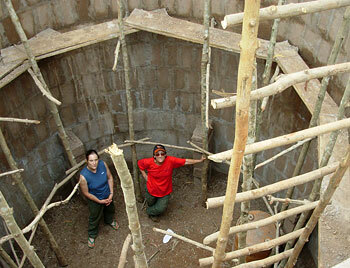 Photo above: Katie and Tii in the cistern under construction. The fundraising was made possible by Maryanne Wakerlin, owner of Solmate Socks. Maryanne provided her popular socks at cost, and Church members sold them at fairs and other events. It was inspiring for Church members and for the community to know they had done something to make life better for children in another village so far away. 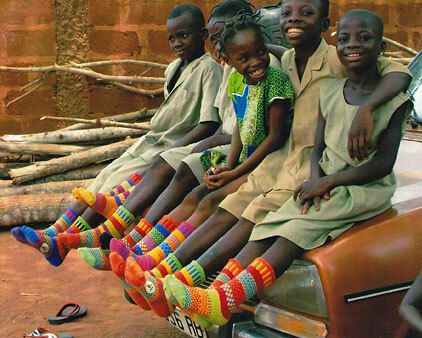 Right: Children in Adjan-houeta wearing their new Sol-Mate Socks.